Romak 3 "Dragunov" Sniper Rifle. 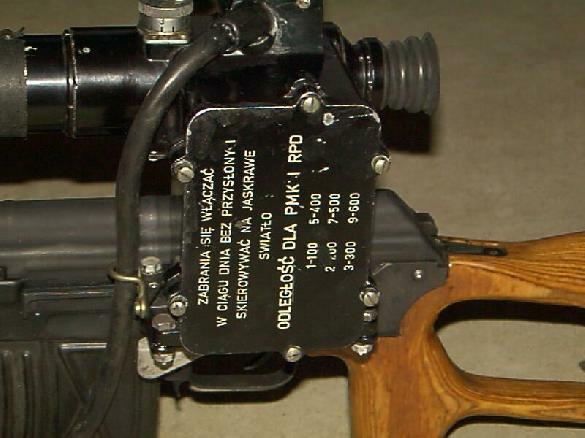 This civilian version goes by several names including SSG-97, Romak 3 and FPK while the military model is the Romtehnica-Ratmil PSL. 7.62 x 54mm. 5 round magazine. This version has an odd-sized scope rail which will not fit the standard Soviet bloc scopes. As pictured, it is equipped with a Soviet bloc night vision scope with separately powered infrared spotlight. Inscription (loosely translated)on side of scope power supply says "Warning! Do not use in sunlight or bright light". Weight of weapon and sight as pictured is about 20 pounds.